Move over IPL, Supremo Chashak -India’s Biggest Tennis Cricket Tournament is here spearheaded by Shri. Sanjay Potnis and Shri. Anil Parab who has taken this initiative under Supremo Foundation. While the name sounds paradoxical, Tennis Cricket Tournament has become the mainstay of the growing desi population in India especially Mumbai. India’s Biggest Tennis Cricket Tournament - Supremo Chashak, is a rare combination of glitz, glory and glamour. 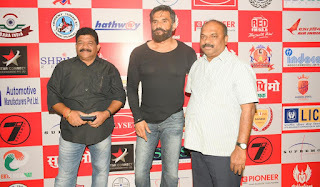 Supremo Chashak commenced on 9th of April, 2017 on Sunday at MCA Club at 7:00 PM in Bandra, saw a star studded line of Bollywood, Sports & Political- Shri. 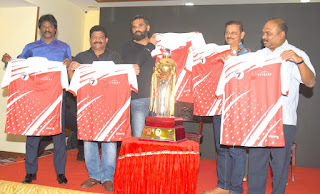 Suniel Shetty, Shri Lalchand Rajput ,Shri Dhanraj Pillay, Anil Parag & Sanjay potnis many more luminaries who flagged off the tournament & revealed the trophy ,Tshirt & prize money worth 10 Lakhs which is the highest prize money ever in Tennis Cricket Tournament & Maruti Alto Car for Man of the series. 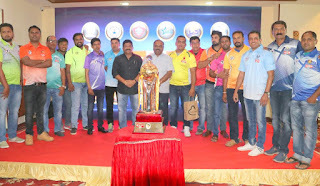 Supremo Chashak will be a battle between sixteen (16) teams- Arjun Sanghatana – Butbori - Nagpur, Dahisar Boys – Dahisar, Ekta Gujrat – Gujrat, Kiran XI (Sandy SP) – Shiravane, Maratha Punjab (Winner) – Bhiwandi, Rajendra Sports – Santacruz, Sara India – Kolkatta, Shantiratna XI – Pune, Star CC – Dandi – Palghar, Tirupati Savarde – Chiplun, Trident (Umar XI) – Navi Mumbai, U.S. XI – Mumbai, Vaishnavi Kolad – Raigad, Vikhrolians Cricket Club – Vikhroli, Yash Bisya Lions – Chhattisgarh will compete on friendly terms yet maintaining the competitive edge of the game. The matches will start from 12-16th April, 2017at Air India Ground. Shri. Sanjay Potnis and Shri. Anil Parab say "It is India’s one the most viewed sports phenomenon and a great name of popular Indian Tennis cricket. This is the tournament which unites youngsters & all over Indian players in the same squad, battling for one trophy. It’s a grand spectacle with the teams giving the fine performance here. In simple words, it is the next level or next step of the Tennis Cricket Tournaments . It is a newly emerged tournament which will, of course, need some time to establish itself" further adding "Supremo Chashak is an amalgamation of sports with philanthropy. It is an initiative under Supremo Foundation who has helped many cancer patients as well as adopted children to develop their skills in sports. We are looking forward to this edition"
The idea of Supremo Chashak - India’s Biggest Tennis Cricket Tournament germinated seven years back in 2010 on the auspicious occasion of Shri. Balasaheb Thackerayji’s birthday as a tribute to the man who gave his heart & soul towards the betterment of the city. In the recent past -Shri. Sandip Patil, Shri. Dilip Vengasarkar, Shri. Dhanraj Pillay, Shri. Mahesh Manjrekar, Shri. Jackie Shroff & many more have supported the initiative. Supremo Chashak - India’s Biggest Tennis Cricket Tournament is a noble step spearheaded by Shri. Sanjay Potnis and Shri. Anil Parab who have taken this initiative under Supremo Foundation who has helped many Cancer patients as well as adopted children to develop their skills in sports, to name one- Prithvi Shaw. The foundation has not only given Rs. 10,00,000/ (Rupees Ten Lakhs) for Drought Relief but also helped many Heart Patients and helped them for their operations and all hospital fees.